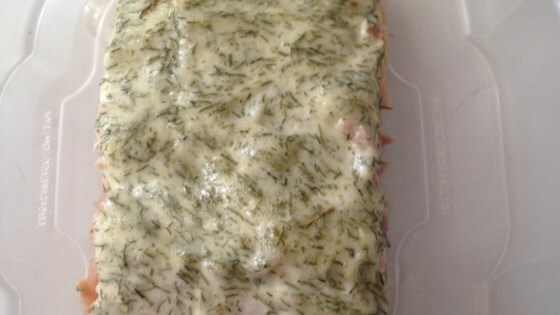 "A quick, tasty dill sauce that compliments grilled salmon." Mix mayonnaise, dill, mustard, and brown sugar in a bowl. Spread vegetable oil over salmon skin. Grill salmon skin-side down on preheated grill. Spread mayonnaise mixture over top of salmon and cook until salmon is easily flaked with a fork, 6 to 12 minutes. Just made this on the grill with cedar plank. Turned out great! Great recipe. But to make the dill sauce lighter use plain yogurt instead of mayo. I made the sauce, and covered a skinless salmon fillet with it, wrapped in foil, and barbecued for about 15 mins. It was so simple, and pretty good. A very easy Monday night recipe! Nice way to make salmon, and so easy. We didn't use any brown sugar and I'm sure it wasn't missed. We will make this again. Anything with salmon is yummy... This was perfect.. I baked in the oven for an hour at 350 degrees and added asparagus. We loved this recipe! It was quick and easy and turned out delicious!